It was just another day at the Half Moon Bay Library when Armando Ramirez received a message on his voicemail asking if he would be at the REFORMA conference in Chicago. The conference is a division of the American Library Association that promotes library and information services for Latinos and the Spanish-speaking community. The caller was the Librarian of the Year committee chair. Ramirez, community services librarian for the Half Moon Bay Library, told the caller, no - he wasn't planning on going. "Then she said 'I hate to tell you, but you have to go,''' Ramirez recalls. Three days later, he was on a plane to Chicago. 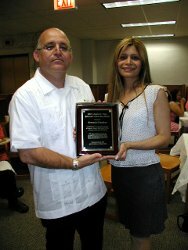 Ramirez was named REFORMA 2005 Trejo Librarian of the Year, a national honor recognizing exemplary contributions to the library profession in the service of the Latino community. The award was presented in Chicago on June 26. "I feel very proud and honored to have been given this award," said Ramirez. "I think even more now, I have to live up to the expectation of what this award means." He had seen the award being presented to many other individuals from all over the country, he said. "I see them and I say 'why me?'" he says. Ramirez may have been shocked, but his coworkers weren't. "I'm not surprised," says Joe Taschik, a librarian at Half Moon Bay Library. "He works very hard and very enthusiastically, especially with the youth." Perhaps most importantly, Ramirez is fluent in both English and Spanish, making him an important resource for both communities. For Ramirez it's all about connecting people to what they need, he says, whether it's helping them find a specific book at another library, or showing them where to access information in Spanish. "My job is to connect the public with information," he says. For many members of the Latino community, he is an invaluable link to information that can be difficult to find in Spanish. "I love the fact that I can reach out to a group. To me what's rewarding is finally getting people in here," Ramirez said. "Outreach is an art." For Ramirez, reaching out to the community has become a mission as well. One of the biggest ways he has made connections is by initiating a bilingual story time, held at the library Wednesdays at 7 p.m. Ramirez reads the same book in English and in Spanish to children and their families. He also started a program called Libros y Bebes, or Books and Babies, promoting literacy for small children. For a half hour before the library opens on Saturdays, children up to the age of 3 can listen to stories, sing songs, or have gentle interaction with adults. Both programs have been met with amazing results and lots of positive feedback from the children as well as the parents, Ramirez said. "They're so happy and they love to be involved," he said. Ramirez also started a teen book club. Members meet at the library once a month throughout the school year to discuss a book they have all read while eating pizza. What really makes the difference are the details, the ordinary acts of kindness and compassion. That's what makes him stand out, people say. "He's really cheerful all of the time," said Miguel Camacho, a member of the book club who also works for the library. "He makes everyone around him comfortable." Camacho said that Ramirez would always give him little life lessons, like reminding him to stay in school, or stay away from drugs. "He's kept me out of trouble," Camacho said. "He's been a lot of help to a lot of other people, not just me." And the words of wisdom come from personal experience. As a youth, Ramirez worked long hours in the fields picking flowers. The work was backbreaking, he said. "I said 'I don't want to be doing this the rest of my life,''' he said. Luckily, Ramirez had a teacher who told him that he was special, that he could go to college, and that he could find a way out. Now, he says, he wants to share that same lesson with all young people, not only Spanish-speaking youth. "We have to educate ourselves," he said. "Education is the only way out." After graduating from the University of California, Santa Cruz, Ramirez first worked as an accountant for a construction company. He left when the work was no longer fulfilling, eventually receiving a master's degree in Library Science at San Francisco State University and working as a librarian for the San Mateo County libraries. He has been working at Half Moon Bay Library for about eight years. And he loves what he does. Every day, getting up in the morning, he looks forward to coming to work. That enthusiasm has earned him a place in library history. "I get paid to do what I do," Ramirez said. "When someone says 'You've done a great job,' it's almost like a paycheck."